In a perfect world, every condition would come with a natural treatment. And although exercises and nutrition can play a role in strengthening and healing the body, they are often best used as a complementary treatment for a number of conditions. Carpal tunnel syndrome exercises fall into this category. Exercises alone are unlikely to relieve pain or prevent the condition; however, performing specific carpal tunnel syndrome exercises after surgery may aid recovery. For mild or moderate cases, wrist-strengthening exercises for carpal tunnel may help if used with other tools, such as wrist splints or changes in behavior. 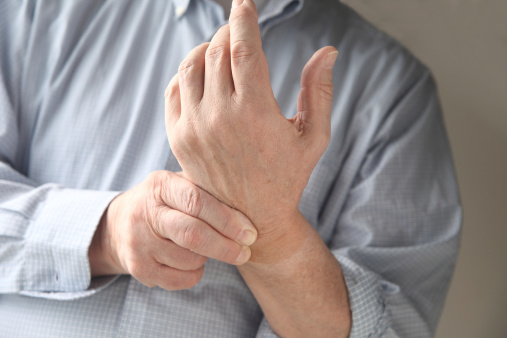 Carpal tunnel syndrome is the result of a compressed nerve in the wrist—the median nerve. The median nerve passes through carpal bones at the front of the wrist alongside tendons in the hand. Long-term repetitive movements, like typing or hammering nails, and fluid retention cause the compression that leads to painful and irritating symptoms such as tingling, burning or numbness. When it comes to performing carpal tunnel syndrome exercises, remember these four words: “If it hurts, stop.” Stretching the nerve to the point of pain can actually make it worse, and it puts you at risk for further injury. Start each exercise slowly and see if they work for you. If they don’t, are too uncomfortable, or leave you questioning if you’re doing the right thing, speak to your doctor before going any further. If you like, you can also try using these exercises as a preventative method. It’s possible that these movements can encourage strength and mobility to reduce the risk of carpal tunnel syndrome. Start by sitting upright in a chair, with your spine straight. Extend each of your arms directly out in front of your body at shoulder height, palms facing down. Turn fingers outwards to the side until you feel a light stretch in your forearm. Hold for five to 10 seconds. Stand up straight and extend one arm out in front of you. Keep your elbow straight with your wrist extended. Take your other hand and gently push the extended hand down, bending at the wrist. Keep your elbow and shoulder in place. Stretch your wrist and fingers as far as you’re able and hold for 10 to 20 seconds. Switch hands. If you wake up with pain or numbness, sometimes just shaking them can restore blood flow and sensation to the area. Sit or stand up straight with your arms outstretched directly in front of you. With your palms facing down, flex your fingers inwards to create a claw, then spread them apart as far as possible. Repeat five to 10 times for every 30 minutes of computer work, texting, sewing, or any activity where hands are kept in a relatively fixed position. Put your hands in a prayer position, spreading your fingers as far apart as you can. Next, “steeple” your fingers by pulling your palms apart while keeping the ends of your fingers connected. With your elbow bent, wrist straight, and fingers together and pointed at the ceiling with your thumb relaxed, curl your fingers inwards. Curl them until they are touching your palm (it should look like you are hitchhiking with curled fingers). With your thumb remaining relaxed, straighten your fingers so your hand has an L-shape. Now, fold your fingers straight down until they are touching your palm. Tuck in your thumb so it touches your index finger. Then curl fingers up to form a fist. Repeat 10 times and perform two or three times per day. Extend your arm in front of you with your palm up and bend your wrist so your hand points to the floor. Take your other hand and gently bend your wrist down further until you feel a mild/moderate stretch in your forearm. Hold for 15 to 20 seconds and repeat two to four times per hand. You can also perform a similar exercise with a weight if you are strong enough. Sit in a chair with your forearm rested along a desk or table. Your wrist should be hanging off the end and your palm facing down. Hold a light dumbbell (or a light object) and flex your wrist upwards as far as possible without the forearm breaking contact with the surface. Repeat five to 10 times, then switch hands. Sit down at a table with your forearm, hand, and wrist lying flat. Your palm should be face down on the table. Put your other hand across the knuckles at a 90-degree angle to add resistance as you attempt to lift the bottom hand up by flexing at the wrist. You will feel the muscles firing in your forearm. You can get a “stress ball,” “Gripmaster,” tennis ball, or grip strengthener to squeeze when needed. Simply hold it in your hand, squeeze, and release for five to 10 repetitions. When used with a wrist splint and other treatments, the above exercises can help get you through the day and be performed virtually anywhere. They are great to use on the job, when sitting down or performing the tasks that may lead to carpal tunnel symptoms. In some cases, and if you have the time and money, there is some evidence supporting the use of alternative therapies for carpal tunnel syndrome relief. Some research has shown that ultrasounds and acupuncture can reduce symptoms associated with carpal tunnel syndrome. Yoga focused on upper-body movements may also be able to help improve grip strength, which can also help with the effects of carpal tunnel. Targeted massage therapy has also shown benefits. If you are looking for alternatives to surgery, these practices may help. To help with costs, learn if your insurance provider will cover them. If you have a severe case of carpal tunnel syndrome that requires surgery, it’s unlikely these exercises will fix your problem. But if you have a mild or moderate case and are using other tools to help, these may help delay surgery and help you deal with symptoms in the short term. Many of them can be accomplished at a desk and take only a few moments, making them a useful, worthwhile tool to battling wrist pain tightness and numbness. Try incorporating these movements into your daily routine to improve mobility, pain, and your quality of life. Even if you don’t have carpal tunnel syndrome, practicing them might prevent the condition from occurring. Huisstede, B. et al., “Carpal tunnel syndrome. Part I: effectiveness of nonsurgical treatments–a systematic review,” Archives of Physical Medicine and Rehabilitation, July 2010, 91(7):981-1004;DOI: 10.1016/j.apmr.2010.03.022, last accessed November 7, 2018. Khosrawi, S. et al., “Acupuncture in treatment of carpal tunnel syndrome: A randomized controlled trial study,” Journal of Research in Medical Sciences, Jan. 2012, 17(1): 1–7; https://www.ncbi.nlm.nih.gov/pmc/articles/PMC3523426/, last accessed November 20, 2018. Madenci, E. et al., “Reliability and efficacy of the new massage technique on the treatment in the patients with carpal tunnel syndrome,” Rheumatology International, Oct. 2012, 32(10): 3171–3179; https://www.ncbi.nlm.nih.gov/pmc/articles/PMC3456919/, last accessed November 20, 2018. Garfinkel, M. et al., “Yoga-based intervention for carpal tunnel syndrome: a randomized trial,” JAMA, Nov. 1998, 280(18):1601-3; https://www.ncbi.nlm.nih.gov/pubmed/9820263, last accessed November 20, 2018. Armfield, M., “Carpal Tunnel Syndrome,” Physio Works, August 29, 2018; https://physioworks.com.au/injuries-conditions-1/carpal-tunnel-syndrome, last accessed November 20, 2018.